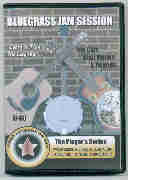 Get in shape and ready for the next jam session or bluegrass festival with this practice VHS tape. Joe Carr and Alan Munde, along with the band, perform 15 songs for you to practice with and they explain each instrument's role in each song as well as provide tabulature for selected solos and backup parts as played on the banjo, mandolin, fiddle, guitar, and bass. Here is a great way to learn some of the exciting and challenging solos of Alan Munde and Joe Carr.